It is high time the European Commission stops dragging its feet and present a legislative proposal to ensure the corporate respect for human rights and to establish binding human rights for European companies, writes Heidi Hautala. Heidi Hautala (Finland), is Vice President of the European Parliament for the Greens/EFA political group. She is a member of EP Committees on Development and International Trade. Over one thousand dead workers, thousands of them injured – and a huge shock. “Rana Plaza” was the worst of tragedies. It has been five years. It is finally time for the EU to adopt clear rules that require European companies to respect human rights in their global operations and that ensure access to remedy for those affected – to make sure that disasters like this never happen again. 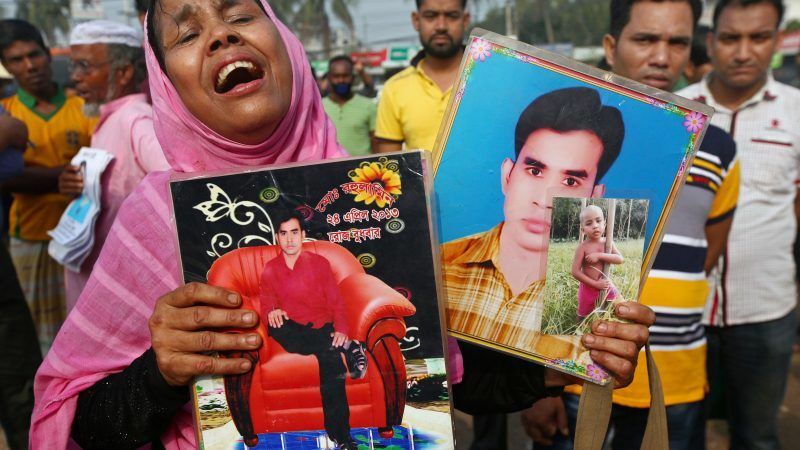 Today, Bangladesh is remembering those killed while sewing clothes for American and European brands. Also today, there are an estimated two million children harvesting in cocoa supply chains, in hazardous or slave-like conditions, a supply chain that ends up on our tables. Meanwhile, in Indonesia and Colombia villagers are resisting the appropriation of their lands for the production of palm oil, the substance without which our supermarkets’ shelves would be almost empty. People at the front of these struggles are facing criminalization, harassment or even murder, as happened to the late environmental activist Berta Caceres and almost 200 other environmental defenders in 2017 alone. For victims of these abuses obtaining justice is a chain of obstacle. We can look at the legal struggles undertaken by Nigerian villagers who lost their livelihoods and even their loved ones as a result of over five decades of negligent American and European-led oil exploitation. The villagers’ judicial tours across the US, the UK and The Netherlands make a textbook case of how financial, procedural and legal barriers transform the right to access justice into a pipe-dream. “Rana Plaza” is not an isolated incident. It is only one piece of the appalling problem that EU needs to resolve with determination and coherence: a responsibility that comes with our role as the second largest economy in the world. Yet, our current response to this challenge is far from satisfactory. The European Commission’s response to the international outcry over “Rana Plaza” was a series of voluntary measures to enhance sustainability in garment value chains. Last year, the Parliament reacted calling for binding due diligence obligations. The 2016 Conflict Minerals Regulation, although weaker than what the Parliament initially demanded, requires certain companies to conduct human rights due diligence in their supply chains. Large public interest or listed companies are also required to disclose human rights and environmental risks linked to their activities and operations, as a start to increasing transparency, and accountability. These are timid positive steps, but we can see that a comprehensive, coherent approach is still missing. Different standards apply to different sectors, and the lack of legal certainty does not benefit communities, consumers, investors, or companies. In light of the European Commission’s inaction, some European States are starting to take the initiative. The “duty of vigilance” law adopted in 2017 has placed France at the vanguard of legal reforms strengthening accountability for companies’ human rights and environmental impacts and access to justice for victims. Other European countries such as Switzerland and The Netherlands are taking steps in the same direction. States like Germany have also committed to assess legislative measures as part of their National Action Plans to implement the 2011 United Nations Guiding Principles on Business and Human Rights (UNGPs). With the adoption of these laws, these States are in fact taking measures to legally implement the UNGPs and, especially, its cornerstone element of Human Rights Due Diligence (HRDD). HRDD has a good potential as a preventive mechanism and as a means to enhance access to justice, something that benefits companies and society as a whole. These developments also represent the acceptance by a growing number of States that voluntary and incentive-driven measures to ensure corporate respect for human rights are insufficient. Civil society as well as the European Parliament have stressed this point on a number of occasions. The European Commission seemed to acknowledge the same when coining the “smart-mix” approach in its 2011 Corporate Social Responsibility Strategy. This lesson seems now to have faded away. The EU Action Plan on Business and Human Rights, promised for 2016, is now long overdue. It is high time the European Commission stops dragging its feet and present a legislative proposal to ensure the corporate respect for human rights and to establish binding human rights due diligence requirements for European companies, including access to justice avenues for victims. Such a coherent framework would help to level the playing field, so that those business enterprises that today do their best to avoid infringing human rights are not forced to compete with those that don’t look beyond their short-term economic profit. For the victims of “Rana Plaza”, and for all the countless victims of corporate human rights abuses, empty phrases are worthless. We need action.